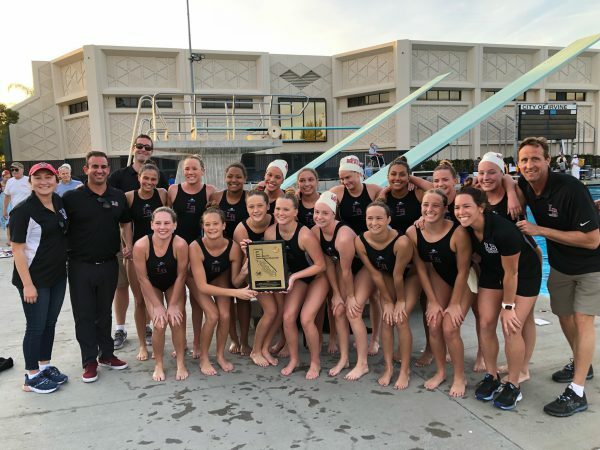 Laguna ended Corona del Mar’s 19-year league title streak with a 6-4 victory on Tuesday night at Newport Harbor High School’s pool to wrap up the initial Sunset Surf League crown. Breakers struggled in the contest with poor shooting, allowing the Sea Queens to tie the score at 2 entering the final period. For the fourth quarter sprint, Coach Ethan Damato (11th season 287-47 record) went back to his primary starting six: Molly Renner, Morgan Van Alphen, Grace Houlahan, Nicole Struss, Tea Poljak, Claire Kelly and the group came out on fire with Renner capturing the sprint. The squad went on the attack as Struss passed to Renner who fired a strong skip shot into the CdM cage for a 3-2 lead. On the next possession the two reversed roles and the Breakers were up 4-2. Corona Del Mar came alive at that point scoring 15 seconds later then tied the score on a power play opportunity with 4:45 remaining. Laguna came back after about 90 seconds as Molly Renner took a pass from Emma Lineback to break the tie with 3:16 remaining in the game. With just over two minutes remaining, Lineback had a dramatic steal and drove to the cage giving the opponents little option but to foul for a five-meter penalty shot. Tea Poljak took the shot and left no doubt with the Breakers sixth goal of the evening. After that, Laguna successfully went into their “four-corners” offense to exhaust the clock as additional steals by Claire Kelly and Lineback minimized Corona’s two possessions. It was Laguna’s 12th straight win in the 37-game series. to keep their #1 ranking, winning the 24th Annual Southern California Championships for the fifth time in the past six years. Front Row: Rachael Carver, Morgan Van Alphen, Quinn Winter, Cici Stewart, Bryn Gioffredi, Molly Renner, Makenzie Beck (Assistant Coach). Back Row: Yoshi Anderson (Assistant Coach), Ethan Damato (Head Coach), Trevor Lyle (Assistant Coach), Jessie Rose, Nicole Struss, Imani Clemons, Tea Poljak, Emma Lineback, Claire Kelly, Kenedy Corlett, Evie Laptin, Emma Singer, Eric Fischer (Assistant Coach). Photo courtesy of Laguna Girls Water Polo. Laguna rallied from a 2-0 halftime deficit to edge #2 Orange Lutheran 8-7 in a thrilling contest right to the heart-stopping save that ended the game. The victory captured the Breaker’s fifth title in six years and redeemed their surprise title game lost last season. Laguna missed all 10 shot attempts in the first half while the Lancers scored near the end of the first quarter and with two minutes remaining in the second. In the wild third period, Laguna got on the board on their first possession when Morgan Van Alphen scored on a power play off a pass from Nicole Struss. Laguna brought in a number of bench players to help energize the team and it quickly paid off as Bryn Gioffredi scored of a pass from Cici Stewart to tie the game at the 3:57 mark. A steal by Jesse Rose led to the first Laguna lead when Tea Poljak scored at 3:20. The Lancers didn’t quit and responded immediately each time the Breakers took the lead with the period ending all knotted at five. The teams again traded back-to-back goals early in the final quarter and it took until the 2:11 mark before Emma Lineback found the net on a score off a Claire Kelly pass. After an exchange of possessions, the Lancers tied the game on a power play with 1:02 remaining setting up the wild finish. Ten seconds into the last minute Lineback drew a five-meter penalty shot that Molly Renner took to give Laguna their final lead. The Lancers tried to work a final shot but lost the ball to a Lineback steal deep in Laguna territory, but the Breakers lost the possession on a possession foul in front of their own cage giving a quick thinking Brooke Houtigan a chance for a point blank O Lu shot to send the contest into overtime. Laguna goal keeper Quinn Winter was able to tip the fast-fired ball off the goal post and safely into Laguna hands as Cici Stewart ran out the clock. To get to the finals, Breakers crushed #13 Agoura 23-7, Coronado 17-4, and Carlsbad 12-6. In the semifinal game, Laguna was up 7-3 over last year’s champion Dos Pueblos before the Chargers rallied to score four goals, the last one coming into the final minute of play to make the final tally 7-6. This is the oldest girls water polo high school tournament in Southern California and featured 30 teams including the top 14 ranked squads, and the Laguna JV that finished 23rd. Up Next: Senior Day is Friday, Feb. 1, 4 p.m. at the Laguna Community Pool versus #20 Los Osos in the final regular season game. Pairings will post on the SSCIF website on Saturday with the opening contest on Thursday, Feb. 7, at a site to be announced next week. (Laguna will be the “home” team but will not play in the undersized local pool). Semi’s are set for Feb. 13 and finals on Feb. 16 at Irvine’s Woollett Center. For the 13th straight season and for the 35th time in 85 seasons, Laguna qualified for the Southern Section Basketball playoffs and will be competing in division 2A, the fourth highest of 10 divisions. Pairings will be released on Sunday, Feb. 3, with the first games next week. Check the Southern Section website for the schedule. Breakers were facing Marina (15-12, 4-1) this past Wednesday night to determine which team would enter the playoffs as league champion. Marina competes in the next lowest division, 3AA. Breakers won their last two league games as Laguna crushed Huntington Beach 59-36 on Friday, Jan. 25, behind Nolan Naess with 19 points. Brooks Hogenauer had four three-point shots. Laguna’s mastery over the Oilers included wins by the JV and Frosh-Soph squads. Earlier on Jan. 23, Laguna defeated Fountain Valley 51-46 as they held off the Barons at their gym. Lucas Kravitz led in scoring with 18 points (four three pointers), Naess added 17. Nolan Naess (Sophomore) has scored 512 points thru 26 games this year and ranks 12th on the all-time single season point total. He should move ahead of his father who is 8th on the list with 547 points scored in 1986. Breakers finished sixth in the Sunset Wave League with Marina (19-9, 6-0) taking the title, Fountain Valley (14-14, 4-2) finishing second, and Newport Harbor third (12-16, 2-4). Breakers lost to Marina 57-22 on Jan. 24 and 73-15 to Fountain Valley on Jan. 29 to complete the regular season. Laguna was ranked #6 in Division 5A the lowest of the 10 playoff groups this past week and are hoping for an at-large berth in the playoffs which will post on Sunday, Feb. 3, in the early afternoon at www.cifss.org. Missing their MVP player Reilyn Turner initially sent the Breakers into a tailspin as they lost to 4th place Marina 6-0 on Jan. 24 but rallied on Tuesday, Jan. 29, to deny Fountain Valley a share of second place and a playoff spot battling the Barons to a 0-0 tie. Breakers finish the initial year in the Sunset Wave League all alone in 2nd place behind Newport Harbor (16-2-6, 5-0-1) a Division 1 school. For the playoffs. Marina and Fountain Valley are both in Division 2 while Laguna will complete this season in the Division 3 playoffs. Pairings will post about 11 a.m. on Saturday, Feb. 2, at www.cifss.org. Breakers should open play next Wednesday, Feb. 6.